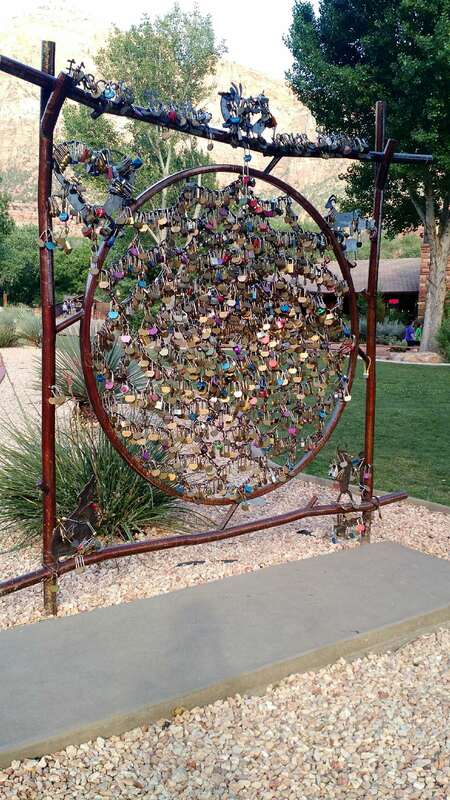 Last year we relocated the Love Locks “Lovescape” in Zion National Park, Utah making it more visible to the tourists. You could say it was the right move because the amount of LoveLocks being shared is amazing. Vickie and I sat for a while just watching the tourists and their interest in the “Lovescape” was very entertaining. People from all over the world gathered and shared the ancient tradition with friends, family and loved ones. Some didn’t even know of the tradition and others had seen it on bridges in Paris, fences in Germany or in simple cities around the world. The interesting thing about the people that gathered by the “Lovescape” they talked to each other, some explaining the tradition and others comparing the LoveLocks they had engraved. Some offered directions to the nearby local retail shop http://toaquimsvillage.com/ where LoveLocks can be purchased. The connection between the people seamed to be from unity and love. There was no contention, anger, racism nothing but a representation of love; healing of broken hearts, the bond between friends, and the solidarity within a family—more simply put: it was togetherness. Locking your LOVE symbolizes a movement towards love, acceptance, and unity.